A solid, high-security padlock made to work with 1/2" (12 mm) square security chain. It's a solid piece of brass and hardened steel that leaves an impression of both quality and durability. Because a good security chain is only as good as the lock you secure it with. This lock's pins are completely shrouded and even protected by the security chain. Thieves look for the quick and easy target, but with this lock, there are no shortcuts! No bolt cutter access! Well, it weighs 2.05 lbs (930 g) and is a handful for anyone with average hands. It's a great balance of feeling and looking really solid without being too big or bulky. You can easily slip this into your backpack, purse, etc. and tote it without weighing yourself down. We know you will be impressed! This is a true, high-security padlock that was hand selected to work with 12 mm square chain. 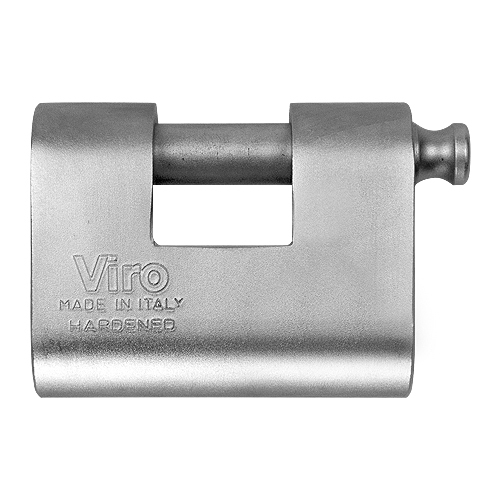 Thieves hate these locks due to the high-quality materials used and their exclusive shape that makes them practically impossible to grip with traditional cutters or other common tools. The body is made from one-piece, special case-hardened and tempered steel. The finish is achieved via a special "NIPLOY PROCESS", which results in a corrosion-proof nickel plating. The dead-bolt is made from case-hardened, tempered steel. The security cylinder is built with 6 pins, replaceable, protected by a rotating anti-drill plate in special case-hardened, tempered 4.4 mm thick steel. 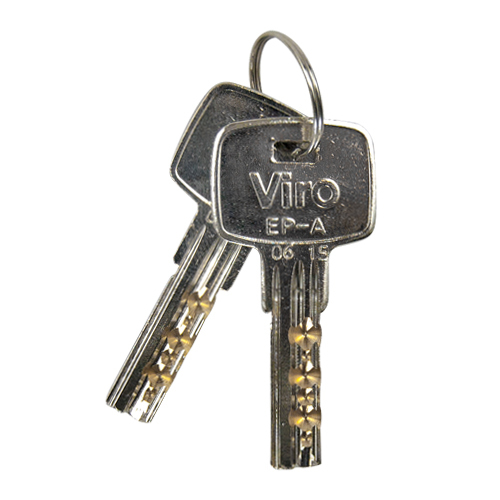 Supplied with two Viro Top Security profile nickel-plated brass keys. If I use this lock with Pewag's 12mm security chain will I be able to put the lock on an end link and a middle link, or must I install it in the end links of the chain only? Yes, we get this question a lot.� You can install this lock using an end link and a middle link, but not two middle links. Are the keys dimpled type or standard? Are the dimpled type much harder to defeat? The keys are dimpled just as pictured, and industry experts seem to agree that dimpled keys make the lock much harder to pick. This lock is listed as being compatible with the 3/8" Pewag security chain. Is the shaft adequately protected from bolt-cutters when the smaller 3/8" chain is used? That is somewhat a matter of opinion. There should be approximately 0.34" of space when used with 3/8" chain, which isn't a lot, but it's not ideal either. 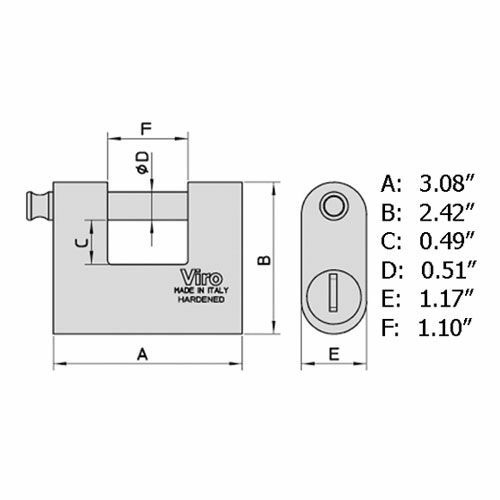 We recommend using the Viro lock designed for 3/8" chain, the #PW-4126 Panzer model. With the Panzer, each link sits in its own pocket, thus the bolt is completely protected. Is it possible to purchase additional keys for this lock? If so, how much do they cost? Yes, replacement key blanks are available here for $10.00/ea. Being in a major metropolitan city, I did some research into Chain/Lock combos, I got this due to MANY expert bike thieves and locksmith's independent endorsements. 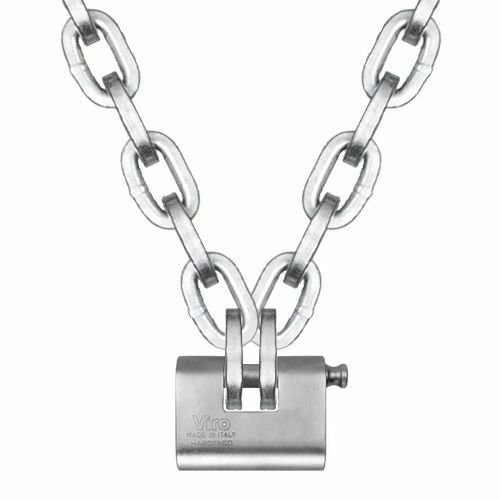 As some have said, ANY lock/chain can be defeated given the correct tools and enough uninterrupted time, but, as a DETERRENT, this Pewag Chain/Viro Lock combo is one of the best available at any price to defend against opportunistic theft. I also use a strong u-lock to make theft even more difficult. To slow down a criminal's efforts (and potentially call attention to him/her) is what this chain/lock will do. Chances are, they'll move to an easier target where less effort will be needed for a quick theft and getaway. Merchant Response:Thank you for the thorough review! This is one secure lock and it's the best quality that I have ever seen in a lock. The design is great as there isn't a place for a person to use a bolt cutter when used with a Pewag chain. ProsWorkmanship and quality is A+. Plus the design is almost tamper proof. ConsThe price is kinda high but worth it. Heavy duty lock, well protected. Selected this over Viro Panzer to mate with the 10mm Pewag chain for a bicycle. Has an anti-drill plate the Panzer lacks and thus a smaller keyway exposure. It should be a good outdoor lock. ConsPretty matte finish will pick up nicks over time. Not really a con, but reality for a workman's lock. This lock comes as described with a hardened steel shell and brass innards. But check various lock picking sites to see that it also has a channel that is difficult to navigate with a pick plus seven (usually such locks have six) pins and all were spools (more resistant to picking than regular pins). ProsImpressive looking security should make a crook look elsewhere; excellent security. A true work of art. This lock is beautiful to hold and look at. A true work of art. Bolt cutters can not even try to attack the shackle because the chain fills the space. I love the anti drill measures. Steel pins that can not be attacked because of the hardened keyhole plate that spins with the drill. YouTube videos show it is hard for locksmiths to pick. The whole body is one piece, thick, and case hardened.